This company offers widebelt finishing machines designed for sanding, polishing, deburring, and finishing applications. 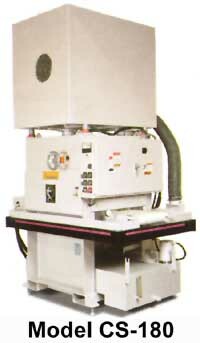 The Models 137-1HPM dry deburring/finishing sander is well suited for typical job shop and finishing requirements. The machine features one 8-hour shift operation per day, a 37- × 75-in. abrasive belt, and 20-hp TEFC main motor. The sander has capacities that include 8.625-in. minimum part length and 36-in. maximum working with. Also available is an optional engineered system with wet dust collector, controls, and ductwork. Also offered is the Model 352-1HDMW, which is designed for high volume deburring and finishing. The machine performs wet operation (also available in dry) and a high production capability of up to 24 hours/day. The finisher is available with a working width capacity up to 64-in. and with multiple deburring heads or brushes. Designed for multi-directional deburring, Model CS-180 is well suited for consistent multi-dimensional deburring and non-directional finishing. The machine features wet operation, a vacuum bed, an air knife dyer, and a tuck under, space-saving filter design. It offers a 3-in.² minimum part size and is available in 18- and 36-in. working widths. Timesavers Inc., 5270 Hanson Court, Minneapolis, MN 55429-3161. Tel: 612-537-3611. Fax: 612-537-9247.